Rose of Sharon (Hibiscus syriacus) is a beautiful hibiscus that can be grown in many climates, where we enjoy its beauty during the summertime. The flowers of the most common variety are 2 to 3 inches and pink with a cherry-red throat. They are edible and also make excellent cut flowers. Native to much of Asia, it is the national flower of Korea. Achieving a height of up to 10 feet, it can spread 4 to 6 feet. Most varieties sport small, lobed, light green leaves. If you plant Rose of Sharon outdoors, it's best to locate it under an overhang close to your house or other protected area, so the frost won't nip it. But be sure to find a spot that gets full sun and has well-drained soil. Better yet, plant it in a large pot, which you can bring indoors during the chilly months. Beauty in the garden is Rose of Sharon's primary asset. It can be planted and pruned into a hedge, which can be so stunning it might just stop traffic if you live on a busy street. Bees love this flower too, so it's a good pollen plant and an excellent addition to a bird and butterfly garden. It is drought tolerant, so if you live in a dry area with warm summers, it should do very well, producing a profusion of flowers. 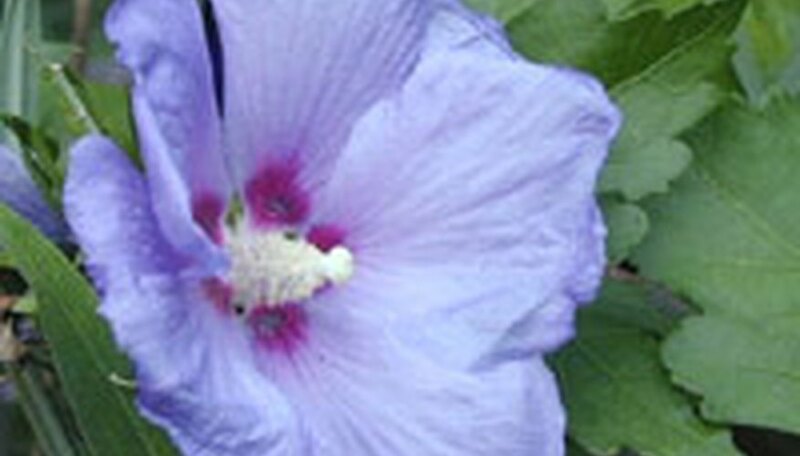 Because it is so popular, Rose of Sharon should be available at nurseries as a bedding plant. Common varieties include Diana, Lady Stanley, Ardens, Lucy, Minerva and Blushing Bride. Some varieties produce white flowers; others can be red, lavender or pink. Rose of Sharon can get large, so allow 4 to 6 feet between plants if you are growing more than one. Choose an area with full sun that has some protection against frost and cold, such as next to a building. Soil should be light and well-draining, so add compost, peat moss or Perlite to the planting hole. If you order seed from a catalog, sow it outdoors in the fall; it will sprout in the spring as soon as the weather warms up. Rose of Sharon also starts very easily from cuttings. Some gardeners report that all you need to do is poke a branch into the ground, keep it moist and, voila, another beautiful flowering plant. Protect Rose of Sharon from cold and frost during the cooler months. It is also deciduous, so fear not if it drops its leaves and looks dormant when fall approaches. But it is generally a low-maintenance plant. Fungal diseases can attack if your Rose of Sharon is not in full sun. It is easy to collect seeds from an older plant if you want to try your hand at starting more Rose of Sharon. Just allow the pods to dry on the plant, collect them and then start them either in the ground or in pots with a fast-draining potting mix. Overwatering can be harmful, so give your Rose of Sharon infrequent water after it has become established.